Acumatica can schedule some transactions that need to occur on a regular interval, like monthly, quarterly, etc. In AP, that includes Bills, Credit Adj, Debit Adj, and Prepayments. In AR, that includes Invoices, Debit Memos, and Credit Memos. Also, Journal Transactions in GL. This document covers AP, but can be applied to GL and AR as well. Here you will be able to enter schedule information, such as a description, start date, expiration date or limit, schedule type, and view the document(s) on this schedule. Yes, you can have multiple documents on a single schedule! 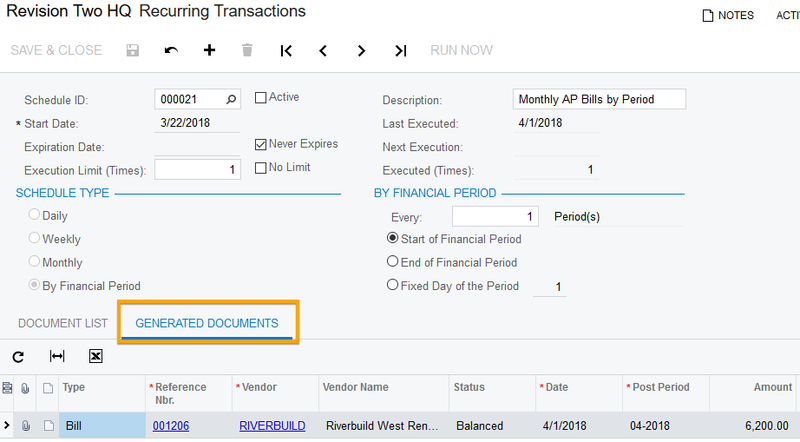 Once you save the schedule, or add the document to an existing schedule, you can hit the back arrow to go back to the transaction. It will now have a status of “Scheduled” and will not be able to be released on its own. That has to be done by generating recurring transactions. 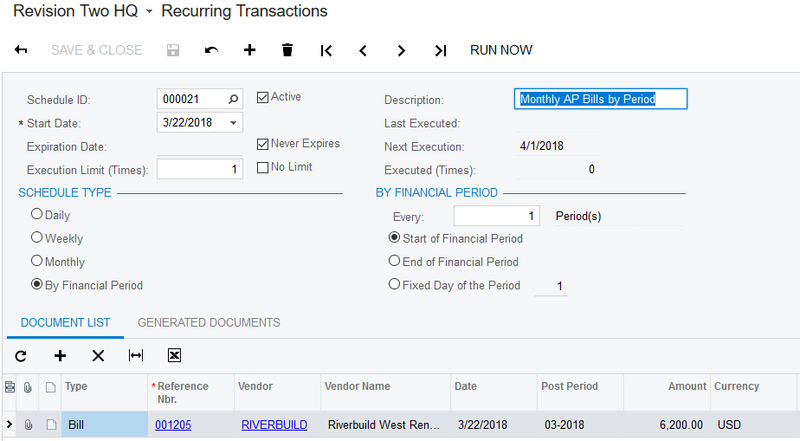 Please notice that on our schedule, the next execution date is 4/1/18, because we told Acumatica to generate these transactions by period, starting at the beginning of the period. In each module (GL, AP, AR) there will be a Generate Recurring Transactions screen. The execution date will default to the current system date, but can be changed. When a schedule is run, the Date and Reference numbers are refreshed (along with Tax Rate and Currency Rate, if applicable). Each new document will have a status of “Balanced” and will need to be released. Futher, the generating of recurring transactions can be scheduled using the automation features of Acumatica. So, the Generate Recurring Transactions window could be scheduled to be run each day/week/month/etc, and would generate documents as defined by the schedule. In our example, let’s generate the document for 4/1/18. Once this has run successfully, you can click on the Schedule ID link to open the schedule, and see the generated documents. You could add the generation of recurring transactions to your month end processing, or weekly processing steps, whatever works for your organization. And if you schedule the generation, you are really putting Acumatica to work for you!